THE CHILDREN’S OMBUDSMAN receives up to 1,600 complaints annually, the Oireachtas Health Committee has been told. That represents a 15% increase since 2010. In the first five months of this year, there was a jump of about 6% from the same period in 2013. Dr Niall Muldoon, Director of Investigations at the Ombudsman for Children’s Office, said the increase was partly due to the OCO’s efforts to raise its public profile. The office was established in April 2004 and has received 10,000 complaints since then. Muldoon said that the majority of complaints received were dealt with within four to six weeks, but he noted that “more complicated cases” could take anything from “two months to a couple of years”. When pressed by TD Robert Dowds on the issue, Muldoon said there were still “too many” instances were complaints were not ”satisfactorily resolved”. He welcomed the recent establishment of Tusla, the child and family agency, saying that about a quarter of all complaints dealt with by the OCO would fall under the remit of the new body. Muldoon said that “child protection has consistently been an issue of concern” for the office, which had to investigate the same issues ”over and over again”. The child is coming closer and closer to the work of the public body. He noted that the majority of cases the OCO dealt with related to children in foster care, with just 5% relating to children in residential care. 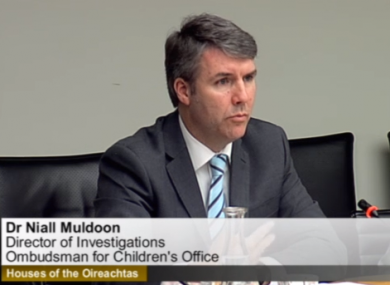 At the meeting, Muldoon noted that a number of OCO reports highlighted ”poor interaction” between the HSE and an Garda Síochána in dealing with cases surrounding children in care. Inter-agency cooperation is still not as smooth as it should be. He said that a number of bodies needed to “be the parent” of the State’s children – not just the department of children, but the departments of finance, education and social protection, as well as Tusla and the HSE. One particular OCO investigation showed that a child had been moved to 11 different residencies in 4 months, while another child was forced to stay in a detention centre longer than they were supposed to as a suitable social care place could not be found for them. Deirdre O’Shea, an investigator at the OCO, said that she was ”satisfied that there was a positive response” to the recommendations made in the office’s 2013 report into the provision of social work in the North Lee area of Cork. O’Shea said that the investigation raised concerns about the “high level” of referral rates and slow response times. She said that “continued monitoring” of these issues was needed nationally, not just in North Lee. The report was carried out after concerns were made about the fact that the HSE could not respond to children who were at “severe risk” of being abused due to a lack of social workers. O’Shea said that “improved communication and proactive responses” were necessary to ensure children received adequate social care and education and mental health services, where necessary. Also at the meeting, Senator Jillian van Turnhout requested that the OCO’s reports be made available to the health committee before they are given to the media, something she said is not currently the case. Muldoon said he would be happy to look into this. Committee chair Jerry Buttimer acknowledged that Emily Logan, the Children’s Ombudsman, couldn’t be at the meting due to a prior commitment, but said she should appear before the committee ahead of the summer recess if possible as she has not met with them for a ”considerable time”. Muldoon said Logan was out of the country at an international Unicef conference, but noted that she would ”quite happy” to accept Buttimer’s invitation. Email “Complaints to Children's Ombudsman have increased by 15% since 2010”. Feedback on “Complaints to Children's Ombudsman have increased by 15% since 2010”.